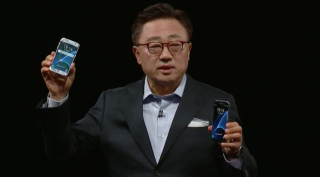 Samsung reveals Galaxy S7 phones at virtual reality launch | What Hi-Fi? Samsung's new flagship phones claim to offer a refined design, better camera and improved connectivity with the Gear S2 fitness tracker and Gear VR virtual reality headset. The launch of the Galaxy S7 and Galaxy S7 Edge phones was beamed to journalists at Mobile World Congress (MWC) using Samsung's Gear VR handset, as Samsung presented not just upgraded flagship phones but a new Galaxy ecosystem of products - with VR at its core. Samsung went on to reveal that anyone who pre-orders a Galaxy S7 phone will get a Samsung Gear VR handset free of charge, and there was a new Gear 360 compact VR camera for shooting your own virtual reality videos. Mark Zuckeberg, CEO of Facebook, made a surprise appearance on the Samsung stage to announce a partnership between Oculus Rift (owned by Facebook) and Samsung on VR devices. The new Galaxy S7 phones led the way at the elaborate launch event, offering the typical refinements and spec upgrades, with a sleeker design constructed from 3D glass and metal, a more advanced camera featuring 'Dual Pixel' technology and upgraded software. Samsung claims the Galaxy S7's CPU is around 30% faster than the Galaxy S6, while the graphics processor claims to be around 60% faster. The Galaxy S7 phones come in Octa core and Quad core variants, there's a bigger battery (3,000 mAh on the Galaxy S7, 3,600 mAh on the Galaxy S7 Edge), the return of a microSD card slot, the option of a dual SIM, and the promise of faster wired and wireless charging. Sporting 5.1-inch and 5.7-inch screens, both Galaxy S7 phones feature a 2560 x 1440 screen resolution (577ppi/534ppi). Both also have IP68 water and dust resistance certification, which Samsung says means they can be submerged in up to a metre of water for up to 30 minutes - so dropping it in the bath shouldn't spell disaster. The Galaxy S7 and Galaxy S7 edge will go on sale in the UK on 11th March, with pre-orders open from Monday 22nd February. Customers who pre-order before 5th March will receive their phones on the 8th March, a few days ahead of the S7 phones going on sale. And if you needed more incentive to pre-order - all pre-orders will get a free Gear VR headset. Samsung also announced a new Gear 360 virtual reality camera, a tiny spherical camera that aims to enable anyone to make their own virtual reality videos. Mark Zuckerberg, CEO of Facebook, joined Samsung on stage to announce the new product, revealing Samsung was using Oculus Rift's software - the company owned by Facebook - inside Samsung's VR products.